not to whine (which are the three surest indicators a whine is in the offing, the immediate offing), but they promised. oh, sure, they said. snow melted by wednesday. warm winds aswirling. heck, i had visions of little spring things poking their sweet nubile necks out from under the insistently dripping-away ice crust. i had visions of sweaters, and only sweaters. i thought boots would be shoved to the back of the closet. i thought i might be able to skip again–or at least ditch the old-lady shuffle that keeps me from breaking my neck, and my hip, or merely my spongy old wrist. dang, i had visions of calling this dispatch, giddy. as in, i thought i would be. here it is, wednesday, all right. and out my window i see this: snow snow snow. not white snow, or not much of it anyway. but rather whole gobs and piles and tundras of gray snow. black snow. snow that has, sorry, worn out its welcome. be white, be fluffy. but do not loiter long past the due date. don’t know about you, but it’s all gotten me a little bit grouchy. like once when i was little and someone promised the circus was coming and i could go, too. but then the day came and went and not even a whiff of an elephant swishing its tail did i get. i know i’m the one who said i liked my winters the real way. the pioneer way. hard and fierce, and pounding right on my windows. but that was way back in february, before my inner hopscotcher-and-jumproper had fully awakened. this here is march. and they promised, is all. it’s just all a big tease, is the problem. the light whispers spring. the big papa cardinal’s out there singin’ his lungs out. and the weather maps over the weekend showed bright shining arrows pushing the cold right up to some canadian lumberjack camp, where at least they’ve got the beards for these things. geez, someone even thought it’d be funny–hysterically funny, i’ll bet–to flip all the clocks forward, trick us into pretending, what, it was the third week in april. ha. some joke. here it is four whole days later and i am still thinking its lunch time when really it’s time for the dinner to bubble away there on the stove. so what if my children are slurping their soup at quarter till eight, and then rolling to bed, because the clock says so. and only because. far as i know, i’m not the only one grumpy. even the sparrows, the ones outside my window, they’ve given it up. ditched the whole plan for that egg-hatching nest. they seem to be huddled instead under a dried grassy blanket. chattering their little bird teeths. my cat apparently catches their drift. i open the door, the way i usually do, he looks bothered, darts me a glance. “you must be joking,” he apparently thinks, as he tucks his tail right back under his haunches and refuses to budge. it is all rather hopeless. i mean, what is the point of all those deep stirrings inside? the ones that want to break out the pink and the soft seafoamy green. the ones that drool for a fiddlehead plucked from the woods. or a fat stalk of asparagus. or a strawberry that oozes its shirt-staining juice down your chin and onto your so-called bosom. i, for one, am employing desperate measures: i saw in the store, two bucks for a handful of daffodils, deeply imported indeed. i grabbed ’em. paid no mind to the fact that their overseas flight might add an inch to the size of my old carbon footprint. oh, goodness. i’m so sorry to take up your time with all this here whining. perhaps like the groundhog i should return to my lair. or whatever it is you’d call an underground hide-out where the sun never shines. and when it does, it’s still cold as cold gets. hmm, sounds like i’m due for spring break. too bad that too could prove to be rather wrenching. i’m staying put, while the rest of the world i’m pretty sure has flights to places that don’t mess with your head. places where spring is what it is. and not simply a season that teases and taunt. sign below if you too are bothered by all this recalcitrant weather. the winds that won’t warm. the snow that won’t go. the ice that refuses to melt. sing your sad song below. and maybe we’ll find solace in each other’s deep undying misery. and maybe some of you folks who live in sensible places–places where warm is warm, and not maybe–perhaps you can blow us some promising weather. Whine away!! Look, I was done with this scene in February. March is slow torture. At least today we have sunshine, although it is a terrible mean tease. Not quite as bad, though, as those lying weather-predictors. I believed them. I sent my children to school today in totally inappropriate clothing. “It’s warm! Really! It’s spring!” I was lying. Ooops. Time to go fetch underclothed daughter and bring her home for cocoa and snuggling under a blanket, or maybe a hot bath, as she will be chilled through and also, most certainly, whining. I have never yet lived though February (let alone March!) in Chicago without wanting to either dye my hair platinum or cut it all off completely, what with all of the massive pent-up “Can’t this HORRIFIC weather just be DONE already?!? !” feelings building up inside and causing me to yank at my hair incessantly. I am 100% with you in spirit. I feel exceedingly guilty bordering on evil saying so, but just last week I realized it was March and I hadn’t had my regular like clockwork normal February meltdown — because the British weathermen tell me this has been the sunniest winter on record in London. We haven’t had any snow at all; it hasn’t yet frozen. I’ll check back in August after we’ve had months of unending rain so you can even the score. So much love from across the pond! Loved pulling up a chair as always… and still following the election coverage like a woman possessed… fingers crossed!! Okay………AZ checking in here……………yep, I better keep my comments to myself………..somebody might throw a snowball in my direction………then again, it would melt awfully QUICK!! Keep your chin up fellow chair puller-uppers……….. wonderful, glorious S-P-R-I-N-G is surely on its way for you too! For those that can’t wait……….we have one inflatable mattress and LOTS of floor space…………. Exactly how many would that inflatable matress hold? Just wondering…..
BGT, can I just tell you how much I totally relate to the hair thing? Why did this occur to me in February? Platinum, yup. I’m past the hair-coloring stage and last night went on a veritable bender of online clothes-ordering. Woke up in the morning wondering if I really had done all that. Oh–and they were all spring clothes, ridiculous things made out of linen that I may SOMEDAY actually get to wear. vam, just a LITTLE jealous of you over there in the blessed homeland…..
and lamcal, wow, there’s nothing like perspective. I have to add that the naturally freezing, aforementioned little girl played outside without a whimper of protest and looked at me quizzically when I picked her up from school and asked her if she had been cold all day. I also have to add that every child in the class was dressed like the very breath of spring itself, so I’m not the only mother who’s living a delusion. You know, tomorrow really IS supposed to be warm. Really. a voice of hope from the windy city, hark, this comes from someone who is slowly being converted to spring, aka a deep lover of almost all things winter: I went for a run along Lake Michigan today and I overheated! The sun shone on the water and I had wished that I would have wore shorts instead of pants. I should note, my rule of thumb, is that as long as my head and arms are covered, I wear running shorts when the temp is above 36.
uh oh. we devolve quickly here, cuz i am pickin’ right up on my fellow bender sister, and revealing, that yes yes i caved to springtime yearnings. deep ones. the ones that could not be satisfied out the window. or in the freezing winds. i too did the clothes thing. catalog came. one i should just throw right out. but, nooooooo. it called my name. heck robert redford is tucked just inside the first front page……he told me to look around, see if there was anything i liked, anything i might wanna tuck in my closet. sort of a little something from bob to me. i looked, i found. rather seasonally schizophrenic though. i went for –yes yes it’s true– cashmere cardigan and huraches. now i LOVE it when a style i always loved, spent years searching for only to be told it was sooooooo last decade, well i love it when those things come back. now i know that ordering shoes over the internet is somewhere south of risky. but risky, frisky i was. so i, like jcv, ordered. i have one other catalog with corners turned on a page of clothes that could only be described as young-er and almost sorta kinda hip. haven’t yet plunged. but a dear friend told me i needed them, the clothes. when a dear friend, a friend who values honesty and kinda likes you too, when she tells you you need some wardrobe rehab, you’d better listen. what, my plain black cotton, drawstring pants cannot take me everywhere i go? oh, it would all be so much easier if i’d not gone to catholic school and fallen early on into the no-think habit of rolling out of bed and slipping on the same old same old 250 days a year. so, i, prey to springtime fever, fell into the same demise as ms jcv. no i did not slash my hair, or dye it green. but i did hope to sneak a box or two in the house, all in attempt to re-infuse this lifeless quasi-season known as the not-yet vernal blahs…. Well bam yer humor is way springy, even if yer weather ain’t. vam already spilled the southwest refried beans…we’re hittin’ 70 up in northern AZ this week…but I recall 2 Easters with snow in the last 2 decades, and this is a very early Easter, so who knows? Hey all … AZ gal checkin’ in (finally). The old computer still on the blink, but found a way to pull up a chair. vam is right … the weather is downright gorgeous ( jcv … wish you were here). But, I don’t trust it. We’ve been known to have snow on the trees as they bud and flower and I worry every year that my beloved trees will get confused by the forecast. But, as my very wise husband reminds me, the trees know what to do. I’m heading to Russia for two weeks–not spring-y at all! But, I hope spring is in the air in Chicago when I return. I enjoy my fun time at PUAC. I don’t watch TV at all. Only the last 27 seconds of the Super Bowl–that’s it for TV in 08, so far. Other than movies, my only screen time is PUAC. Too busy living for much else..
PUAC itself is like a breath of spring in an otherwise wintery world…nice to know others look for and find the grace when our society leans towards the dark…say a prayer for more light, love and grace in our world! Okay……..are you guys up there in the ‘still’ frozen north tryin’ to pull a fast one?? ?……..who’s sending the WIND down here to AZ? ?……… ever since the AZ comment was posted the wind has not stopped down here……..guess that’s is what we get for being a little cocky about the beautiful climate……. please, please, please come and reclaim YOUR wind, windy city dwellers……. I don’t have enough hairspray!! The hubby just informed me that HE will wear SHARTS (he’s trying to acquire an Irish brogue by Monday) in defiance of the wind………wait a minute, he is now revisiting the decision….yep, wearing the ‘sharts’……….could be worse…..could be a ‘kilt’……..and with this wind….oh boy..
Where do you buy a nice kilt around here with a 36 inch waist? vam, you got that right … this wind is ridiculous. Even tore the canvas awnings off of the house. Just another hair wreckin’ day here in Prescott Valley. And … 60% chance of SNOW here tomorrow. Spring, anyone … anyone? Bueller? Bueller? In February, I spent a week in Scottsdale Arizona with temperatures dipping quite low – so chilly that doors to the outdoors remained closed, the pools remained empty and still and Easterners who traveled across the country with visions of sun and warmth were left quite grouchy. 2 weeks ago, i traveled to Santa Fe New Mexico for a long weekend and instead of the sun and dry warmth, I found downright cold temperatures and 2 inches of snow when I awakened in the morning followed by snow the next day. The most predictably warm weather has been found in Chicago – the city with the most promise that spring is in fact in the wind. Chicago, we’re getting big, fat flakes of snow here in the high desert mountains of northern Arizona today, so I hope our regularly scheduled sunshine found it’s way to you and you’re seeing some promise of spring. Alert!!! Alert!! Crocus leaves spotted around and near melting snow in Chicago. Sorry about the wind AZ folks…..guess we are all in the same mixed up season – “sharts” and all! Go for it though – God loves an optimist and so do we all. lamcal, you bring us all needed hope … I just checked the big terra cotta pot on the deck where the beloved hydrangea has been hybernating … new growth is emerging … even with a dusting of fresh snow. Okay, folks, just got back from VA and I saw a crocus this very morning there. A purple one. It was so dear. Saw trees blossoming, albeit just a few. Most everything was gray but with that tiny barely visible undertint of spring green. Did wonders for my soul. As for outdoor pots, here is what happened to one of mine this winter: it just cracked to pieces all on its own from, no doubt, too many freeze-thaw cycles. I have just left it in place on the front walk, a lovely big terra cotta planter that looks as if an odd bomb dropped upon it which shattered the pot and left the dirt intact. It’s very depressing. I’ve got to get rid of the thing soon and put out something cheering. 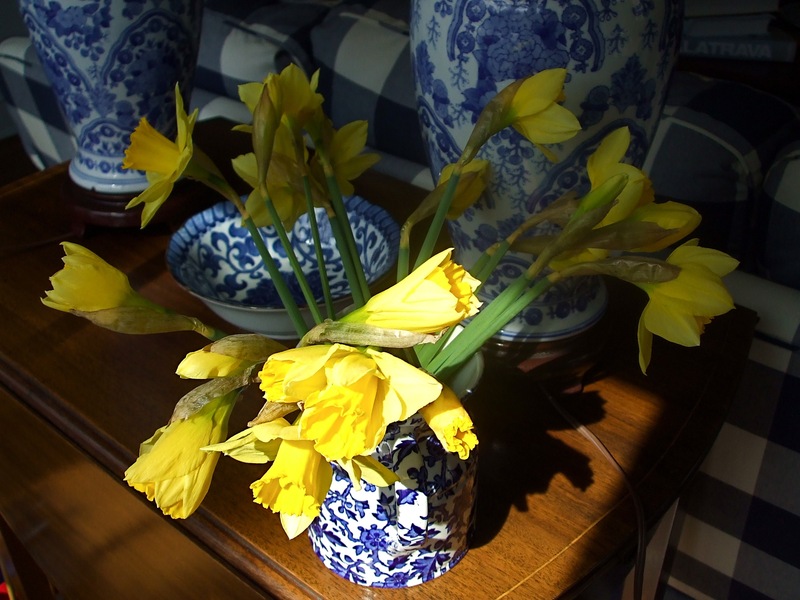 A pot stuffed with silk daffodils?